One of the most frequent questions I get asked is “how do I get a job in venture?” In fact, I’ve written two posts over the years on this topic – one way back in 2005 and a follow-up to that a few years later in 2008 (the 2nd of the post is the more practical advice if you’re pressed for time; or just keep reading below). A lot has changed in the past 10 years since I wrote my most recent post on this subject. And a lot hasn’t. Below is an updated overview of the venture job landscape as well as some current thoughts on how to break into the industry. First some stats to outline the landscape. 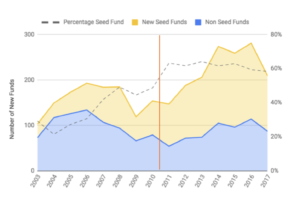 If you’re trying to break into venture the news, in general, is good (the two charts below were pulled from a great post by Eric Feng on the state of the VC market from late last year). 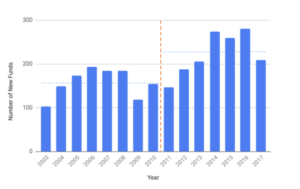 The number of new venture firms raising their first fund has increased markedly – especially since 2011 (new funds are a good barometer of the growth of the industry, and a leading indicator of job growth in venture capital). 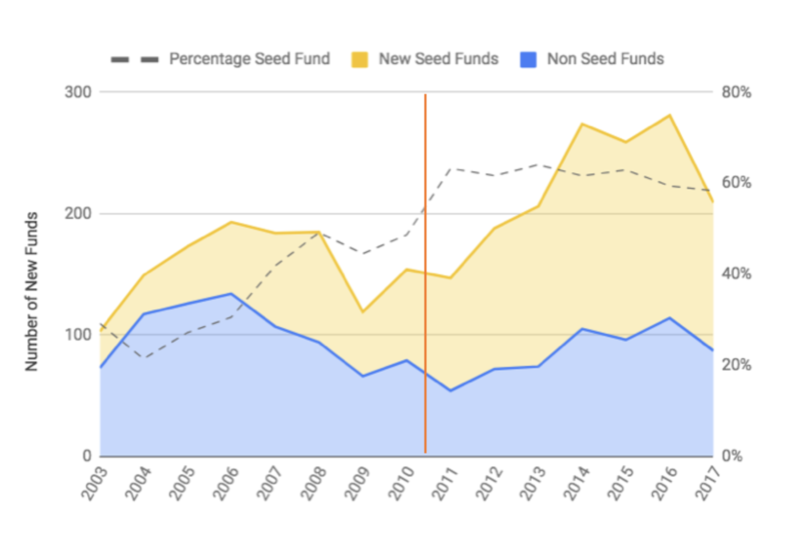 It’s interesting to note that the majority of these new funds are focused on Seed stage investing (not surprising if you follow the market, although investments at the Seed and Seed + stages have started to decline quite a bit from their peak a few years ago). So the venture landscape has changed quite a bit since my first post on breaking into venture almost 15 years ago. So has the typical profile of a venture professional. When I first got a job in venture (now we’re going way back – that was 18 years ago) the typical venture analyst had spent 2 years in an investment banking program (maybe, but less likely, a consulting company) and spent a lot of time on the business end of spreadsheets. A venture associate had that same background, had likely worked at a venture firm as an analyst and gone back to business school. Venture principals (VPs, junior partners or other similar titles) were former venture associates who had worked their way up the chain. And partners were former junior partners who had been promoted up as well. Occasionally partners were former successful CEOs who joined the firm that backed them – at the time the most likely way to get into venture w/o having come up the ranks. In fact the hierarchy was so well entrenched, I remember at least one firm when I was applying to be an associate telling me that they’d only consider me for an analyst position because I lacked an MBA (the job I was leaving was running a $55M division of a public company with over 200 people reporting up to me; I had spent the 5 years before that managing teams of various sizes around corporate development, planning, investor relations, etc. But that experience didn’t matter at the time relative to my lack of a business degree. Needless to say, I turned down the offer to interview for that analyst position). Today the market is quite different and people from a much wider variety of backgrounds are finding their way into venture. And with more, smaller, seed focused funds, VC firms can be scrappier and more thoughtful about who they want to hire and how and where they find them. Take the long view. Despite the relative increase in number of venture firms, there still aren’t all that many jobs in venture. 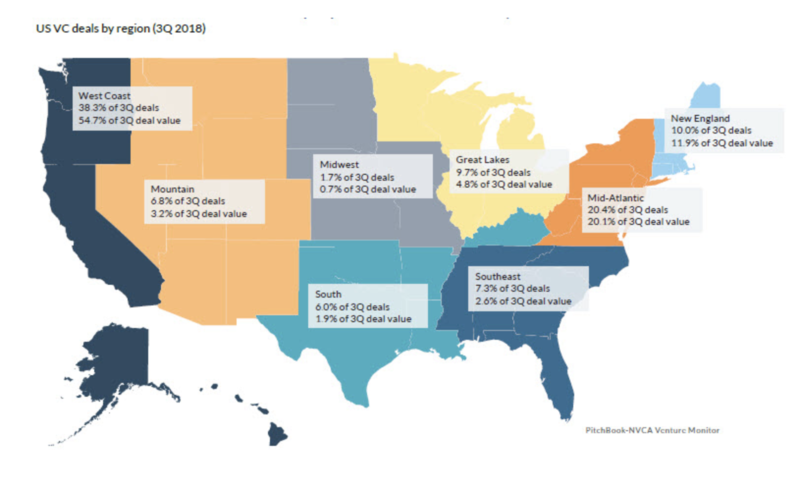 And they continue to be concentrated on the coasts to a large extent (see the chart that shows the data from Q3 2018 – generally representative of where the market is at the moment). Embrace that it’s a long shot and enjoy the journey. Which is to say that the things that will prepare you for, and expose you to, a job in venture are things that are generally helpful to you in any career that is focused on entrepreneurship and startups. Not getting a job in venture may be the best thing that happens to your career. Get involved in your community. Venture and entrepreneurship aren’t spectator sports and are best experienced from within. Most cities now have various local tech meetups, pitch competitions, angel groups, etc. Get out there and participate. If you can, help organize and become a leader in your community (great entrepreneurial ecosystems are inclusive and have many leaders). If you’re interested in startups this should be both fun and easy. Make your presence known and appreciated. Find a gap in your market or someone or something that needs help and get after it. You’ll not only be helping your community, you’ll be making a name for yourself. Get involved in companies. There are lots of great ways to help out companies directly. Hopefully through your work above you’ll be meeting lots of interesting people and companies. Do your best to help them out. Depending on your skill set and level of experience you may be able to offer your services directly to companies (we have plenty of people do this through Techstars for example). Figure out a way to connect interesting people together. Work your network. Network. Most people are terrible networkers. They treat networking transactionally and they are always looking to take from their networks vs. give to them (good networkers adhere to the #givefirst mentality). Become a better networker and actively work to build out your network – of course including your local venture community as much as you can. This will pay dividends no matter where your career ends up taking you. If you do it well you’ll learn to love it (at least I hope you will). Here are two posts with some basic networking ideas to get you going (here and here). Engage. Lots of venture capitalists put out a lot of content and it’s never been easier to engage with the venture community. Comment on blog and Medium posts, follow VCs that you respect on Medium and Twitter, send them ideas and thoughts on what they’re writing about and investing in. Stay active and top of mind. There are virtual communities in the comments sections of some venture partner and venture firms blogs. Participate. Personally I have long standing relationships with people who regularly email me with thoughts and ideas that are relevant to Foundry and our investment focus. Like most VCs I’ll take the time to engage and respond to people who are genuine in their outreach and especially those that are trying to be proactive and helpful. My favorite response to people who ask me “what can I do to help you” is to ask them to send me anything they find that’s interesting and piqued their interest (not necessarily venture or startup related). My Pocket reader is full of articles and stories that are sent to me this way. I know many other VCs do the same. It’s a genuine way to start to build relationships. Look for any way in. Your first job in venture is typically the hardest to get. As more firms are expanding the roles they play with their portfolio, look for different ways in. Many firms now have operational groups that provide services to their portfolio companies. There are a growing number of firms that have someone running “platform” or “engagement” to better connect their portfolio CEOs. More broadly, there are plenty of non-traditional firms out there (not captured in the data above) that are investing either private, foundation or corporate money. In some cities there are organized angel groups that make use of part-time help to make investment decisions. Any job that gets you exposure to making investment decisions or helping those that do will be a good first step into venture. Work for a startup or start one of your own. This was true 10 years ago and it remains true today. A great path into venture can be to start your own business or work for a startup. It’s a great skill-set to have and will likely put you in contact with the venture world. Invest if you can. With investment becoming slightly less regulated there are opportunities to put even modest amounts of money to work through platforms like AngelList and others. If you have the ability, it’s not a bad way to show an interest in investing and give you something to talk about in your networking. Obviously this requires at least some amount of capital and I’m not suggesting that it’s a prerequisite to get a job in venture. But if you can do it, it’s a great way to build a mini-portfolio and may lead in unexpected directions.